While there are a number of podcasts I listen to regularly, I never knew I’d be on one. Sure, for some, being “on the air” is common, but it was something I’ve not done until now. Gear Viewpoint, which I’ve written comments on past shows, and I’ve exchanged a few tweets with the hosts, Keith Tharp and Ron Risman, recently announced a format change to the show. I’d always enjoyed the banter between them, especially their discussion on crop factors. It was one of those podcasts where people where looking at me oddly and wondering why I could barely hold back my laughter while commuting. Having brief chats with photographers from all skill sets, styles and disciplines to spark discussion and thought on photography in general. My Hope is that these little chats will keep everyone’s photography juices flowing and possibly offer a little fun, learning, and growth in a neat little consumable package. I had recently written to Keith asking when the next show was going to be because I hadn’t seen one in a bit, and about a little issue I was seeing on his blog. Keith responded and asked if I’d like to be on as a guest in the new format. I really like the idea of hearing some fresh voices, and didn’t think it would be mine, regardless, I happily agreed, and the result is now “on the air”. If you’d like to listen to our conversation about some luck I had selling images from flickr, the new TSA “Photographerd in hoodies are probably terrorists” poster, and more, head over to the Gear Viewpoint site, or subscribe in iTunes. Time fields in Lightroom metadata, where are my sub seconds? 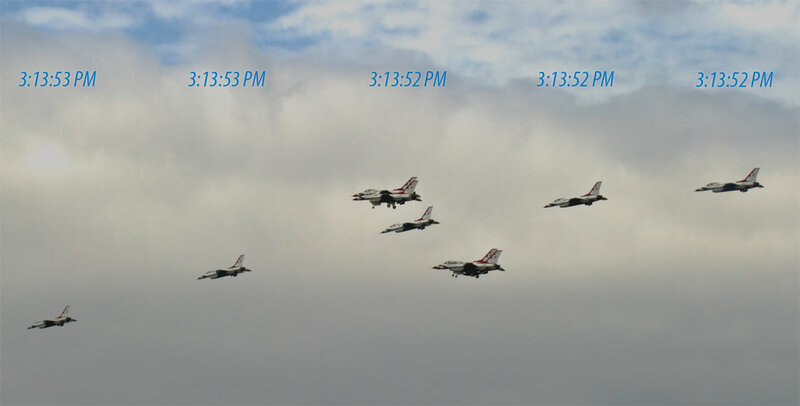 I was talking with my spotter brother about the air show photos I posted on flickr and he mentioned it would be cool to include the time stamps on the multiple frame photo I posted on flickr of the USAF Thunderbirds maneuver where four F16’s fly in formation with their gear down, and a fifth F16 comes streaking in between them. The one I did quickly and posted to flickr had four frames, but this final edition has the five frames that my 7D was able to capture. As you can see, the whole sequence took less that 2 seconds, but unfortunately, the main capture date/time field in the EXIF specification only stores the capture time at a resolution to the second. According to the EXIF specification, the format is “YYYY:MM:DD HH:MM:SS”+0x00.